May is a great month especially if you are a birder. I have seen over 150 species in the past few weeks. Some of the highlights were up close looks at a Scarlet Tanager and a pair of Cape May Warblers at Stratford Point, a Bay-breasted Warbler at another location in Stratford, a Canada Warbler while birding the local neighborhood, and this morning I got to band a Mourning Warbler. Another species that I’ve encountered in surprisingly good numbers is the Clapper Rail. I first heard the repetitive ticks of this elusive marsh bird at the Charles Wheeler Wildlife Management Area boat launch in Milford on May 11th and since have heard or viewed the species on a trail in Stratford Great Meadows on May 17th, from the boat launch at the end of Circle Beach Road in Madison the next day, and from the parking lot at on May 22nd. Rails are an elusive group of birds. Narrow and hen-shaped, they slide through the tall grasses of coastal, brackish, and freshwater marshes foraging on plant material, invertebrates, and small fish. They are more often heard than seen, so listen for their ticks and grunts early in the morning and after dark. 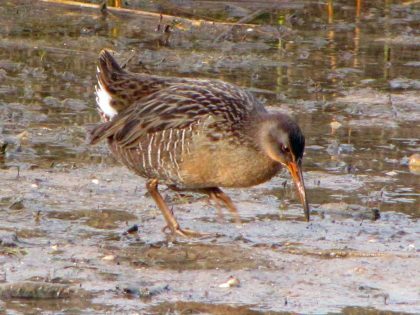 Clapper Rails inhabit salt marshes, while the King and Virginia Rails and Sora are more common in freshwater marshes. A few years ago, I convinced my husband (a birder by osmosis) to join me for some late night birding. We first tried for owls to no avail, then proceeded to a freshwater marsh. My husband was skeptical until not one but three Virginia Rails responded to the grunts coming from my iPod. A few minutes later, we heard the “Ker-mee” of the a Sora. It was one of those moments when nature just blows you away! Getting back to the Clapper Rail, the adults are brownish gray with barred flanks, a long, slightly decurved bill, and strong legs. The chicks are jet black. Keep an eye out for these little treasures scampering across mudflats at low tide later on this summer. And when the tide comes in, you may even spy them swimming across channels in the marsh. While the Saltmarsh Habitat & Avian Research Program estimates the Connecticut population to be just 124 individuals (2015), they are far more abundant in the mid-Atlantic (the estimated population in Delaware, for example, is 7,669 individuals). Their nests are susceptible to flooding during coastal storms and full moon high tides, so they are considered a species of moderate concern in the North American Waterbird Conservation Plan. In other words, this is a bird to keep a watchful eye on.